April 2017 – Click here to view the full Press Release. ECC Timber, one of Ireland’s leading timber processors, was recently awarded PEFC Chain of Custody Certification by Exova BM TRADA, making it the first sawmill in Ireland, North and South, to hold dual FSC/PEFC certification. 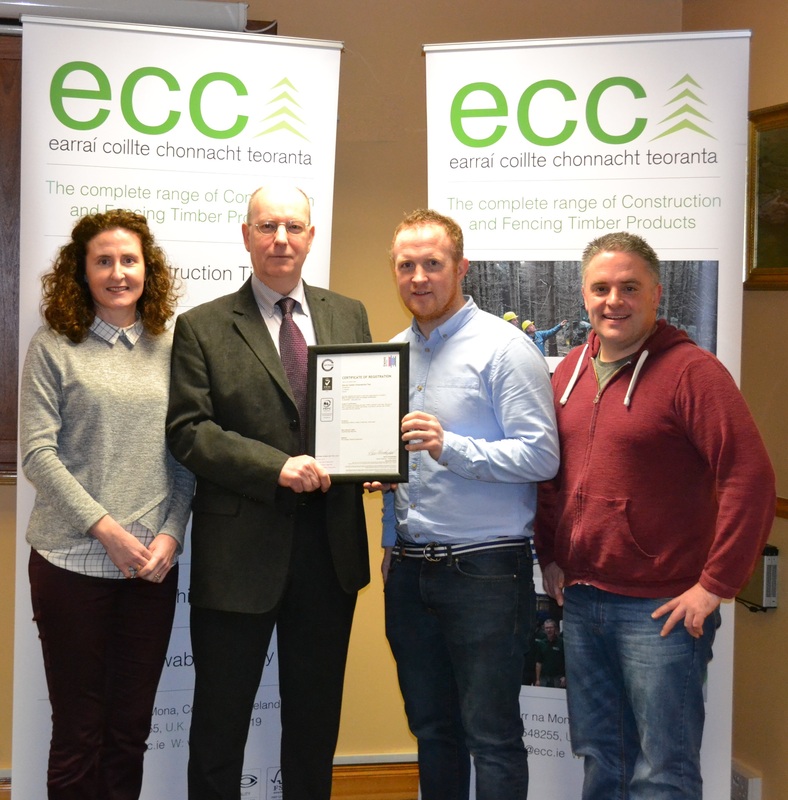 On being awarded PEFC Chain of Custody Certification, ECC Timber’s Managing Director, Mr. Daryl Fahy, stated, “Our new accreditation to the PEFC scheme further enforces our commitment to sustainable forestry and provides our customers with a complete range of fully certified timber products“. ECC Timber is now one of only two major timber processors in Ireland to hold dual certification, the other being the Coillte owned OSB plant Smartply Europe Ltd.
Commencing in the autumn of 2016, ECC Timber worked with PEFC Ireland to achieve its aim of PEFC certification in response to growing customer demand, principally in the UK, for PEFC as well as FSC certified timber products. Moreover, ECC Timber’s experience shows that it is relatively straightforward for a sawmill to achieve dual certification and this may well prove to be a trend in the future. Conor Fahy, Quality Manager for ECC Teo, being presented with PEFC Chain of Custody Certification by William Merivale (PEFC National Secretary). Pictured, left to right, are Kathleen Coyne (ECC), William Merivale (PEFC National Secretary), Conor Fahy (Quality Manager ECC) and Chris Kiely (ECC).